The Kennett Knights won the 2011 baseball Tournament of Terror. 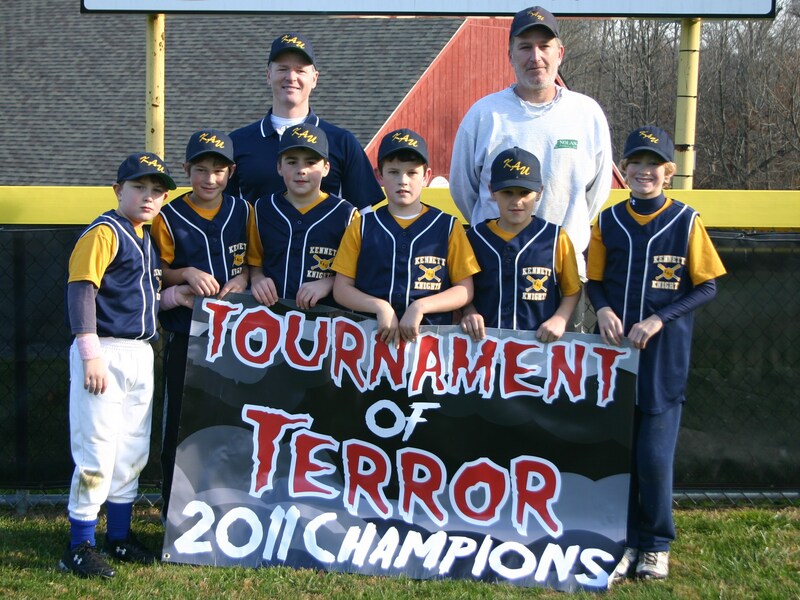 The 10-year-old Kennett Knights baseball team won the first-ever “Halloween Tournament of Terror.” The Knights, all of whom are students in the Kennett Consolidated and Unionville-Chadds Ford School Districts, defeated Avon Grove Bulldogs 1 on tiebreakers in the rain-shortened tourney. Other teams participating were: Avon Grove Bulldogs 2, Downingtown Devils, Game Ready Dragons, Lionville Hillcats, and Oxford Outlaws. Accepting the championship banner were, left to right: (back row) Coach Pat Lyons, Coach Gene Weaver; (front row) John Vogel, Richie Kline, Jacob Juul, Shane Lyons, AJ Weaver and Michael Walter-Dillon. Team members not in the photo are Dylan Blackburn, Patrick Bromley, Jason Granato, Zach Lindner, Connor Schilling and Coach Pat Lindner.